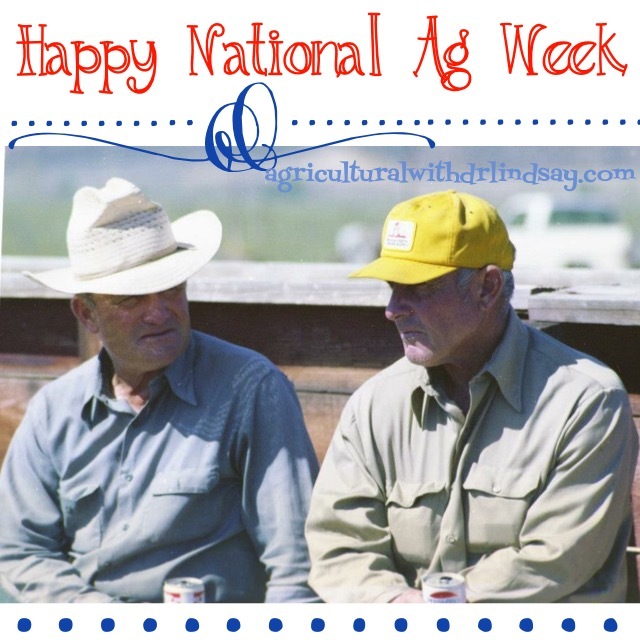 As National Ag Week continues (also posted here and here), I wanted to share an oldie but goodie. My sister and I are the 4th generation on our family ranch which has been in our family for about 100 years. Below is a picture of my Grandpa (aka Pop) on the right and his brother, my great uncle (aka Bob) on the left (both have since passed). This was taken after working cattle, and they were washing down the dust with a Budweiser and a Pepsi, respectively. I have so many great memories of ranch work with my family, including moments with both of these guys. J and I are the 4th generation on this ranch. It’s an honor to be able to carry on a family tradition and way of life on the same land as J’s parents, grandparents and great grandparents. Sister and I are the 5th generation to be involved in prodution ag on my Mom’s side of the house. One of Mom’s cousin’s has gotten into geneology and says that our ancestors have been farmers for as long as there is documented history on our family. The ole saying that ag roots run deep is true!